For the 75% of women experiencing some symptom of Pre-Menstrual Syndrome and feel there is no relief in sight, get ready to find out how the world of herbal medicine can help. PMS can kick start symptoms that often occur for up to two weeks before the onset of your menstrual flow. These include issues like breast tenderness, bloating, fluid retention, tiredness and headaches. Many women also complain that their hormonal fluctuations also cause emotional PMS symptoms including mood swings, irritability, anxiety and depression. In one study at Cornell University, brain scans of women during peak PMS time showed much greater activity in the frontal lobes – the area that controls our emotions. However, once menstruation began that high-level of activity in the frontal lobe was no longer visible. TL;DR The changes that occur in PMS are not just in a woman’s imagination. They are a response to a complex set of reactions and chain reactions involving neurotransmitters and hormones that affect a woman’s energy, feelings, and responses to life. 1—Weeks 1 – 2 (after your period). In the first two weeks after you menstruate you should have higher estrogen levels. By mid-cycle, they have often increased 10-fold before falling steeply again. 2—Weeks 3 – 4 (after ovulation). In the second two weeks of your period cycle, as ovulation occurs and your body releases an egg, your levels of progesterone should be higher (this prepares your uterus for possible implantation). Unfortunately, many women have high levels of estrogen throughout their menstrual cycle and insufficient progesterone production – leading to a progesterone deficit in the second half of their menstrual cycle. A condition, called estrogen dominance (ED) is a common cause of PMS symptoms in women. Though lifestyle factors including exercise and yoga can help balance hormones, many women need more help from Mother Nature’s remedies, to alleviate PMS. Lavender. German research comparing the internal use of lavender to sedating benzodiazepine medication for anxiety, has found it provides equal benefit, minus the side effects of the meds, which may include tiredness, trembling, dry mouth, nausea, and addiction. Lavender can also help promote skin healing and better quality of sleep. To make fresh lavender tea, add lavender flower bulbs to a tea ball and infuse for 10 minutes or longer in hot water. Clary Sage. The essential oil extracted from this flowering herb is often used in aromatherapy to help calm, relax and induce a sense of well being. Research has shown that women who inhaled clary sage vapors from essential oil experienced calming effects, confirming that the clary sage quickly prompted a relaxation response. Chasteberry. This powerful little brown berry can be a woman’s best friend if she suffers PMS. Research shows that after using it internally as a tea or a tincture for three consecutive menstrual cycles, 93% of women enjoyed a decrease in PMS symptoms, such as fluid retention and cravings. The chasteberry also helped reduce hormonal symptoms such as depression and anxiety. Traditionally this herb is used through days 14-21 of your menstrual cycle, but many people find benefits using it all month long. Dandelion Root and Leaves. This common weed found in the yard has been found to help with fluid retention. 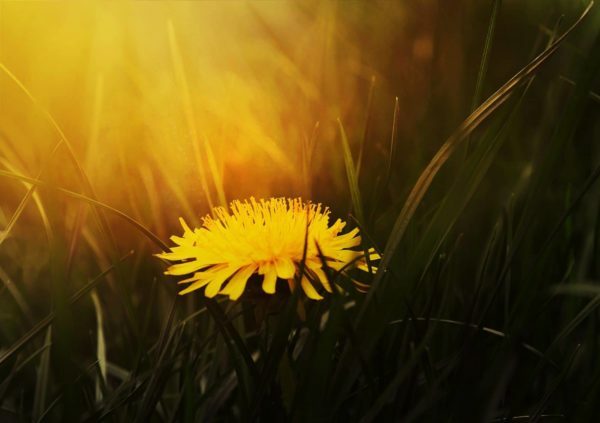 Research shows promise using dandelion internally as a diuretic with increased urination. Dandelion has the added benefit of supplying the body with minerals like potassium, that are often depleted when using prescription diuretics. Dandelion root is also used traditionally to stimulate and detoxify the liver which can help promote estrogen metabolism during PMS. Be mindful that dandelion root is high in polysaccharides, so it should be avoided if you are sensitive to FODMAPs (carbohydrates that can cause digestive problems). Lemon Balm. Though often used as a mild sedative, calming sleep aid, and anxiety combatant, lemon balm has other hidden talents. It is also a powerful memory booster and can improve concentration. Many practitioners believe this is due in part to the actions of the rosmarinic acid in the plant, which has antioxidant and anti-inflammatory responses. Learn about 20 healing herbs and spices to help support and heal your thyroid, adrenals, menopause, weight, hair loss, cellulite, PCOS, hot flashes (and more).